Definition at line 52 of file util-logopenfile.h. Definition at line 69 of file util-logopenfile.h. Referenced by LogFileFreeCtx(), and LogFileNewCtx(). Definition at line 133 of file util-logopenfile.h. Definition at line 82 of file util-logopenfile.h. Referenced by SCConfLogOpenGeneric(), and SCConfLogReopen(). Definition at line 79 of file util-logopenfile.h. Referenced by LogFileFreeCtx(), SCConfLogOpenGeneric(), SCConfLogReopen(), and Unified2AlertInitCtx(). Definition at line 110 of file util-logopenfile.h. Referenced by SCConfLogOpenGeneric(), and Unified2AlertThreadDeinit(). Definition at line 54 of file util-logopenfile.h. Referenced by LogFileFreeCtx(), SCConfLogOpenGeneric(), SCConfLogReopen(), Unified2AlertInitCtx(), and Unified2AlertRegister(). Definition at line 73 of file util-logopenfile.h. Referenced by LogFileFreeCtx(), LogFileNewCtx(), and LogFileWrite(). Definition at line 129 of file util-logopenfile.h. Definition at line 117 of file util-logopenfile.h. Definition at line 88 of file util-logopenfile.h. Definition at line 120 of file util-logopenfile.h. Referenced by OutputJsonRegister(), and SCConfLogOpenGeneric(). Definition at line 126 of file util-logopenfile.h. Definition at line 55 of file util-logopenfile.h. Definition at line 101 of file util-logopenfile.h. Referenced by LogFileFreeCtx(), OutputJsonRegister(), Unified2AlertInitCtx(), and Unified2AlertRegister(). Definition at line 102 of file util-logopenfile.h. Referenced by LogFileFreeCtx(), and OutputJsonRegister(). Definition at line 90 of file util-logopenfile.h. The interval to rotate the log file Used by some alert loggers like the unified ones that append the date onto the end of files. Definition at line 97 of file util-logopenfile.h. The next time to rotate log file, if rotate interval is specified. Definition at line 94 of file util-logopenfile.h. Definition at line 123 of file util-logopenfile.h. Referenced by LogFileFreeCtx(), SCConfLogOpenGeneric(), and Unified2AlertInitCtx(). Definition at line 113 of file util-logopenfile.h. Definition at line 85 of file util-logopenfile.h. Definition at line 107 of file util-logopenfile.h. Definition at line 106 of file util-logopenfile.h. Definition at line 89 of file util-logopenfile.h. Definition at line 62 of file util-logopenfile.h. Definition at line 76 of file util-logopenfile.h. Referenced by LogFileWrite(), and SCConfLogOpenGeneric(). Definition at line 68 of file util-logopenfile.h. 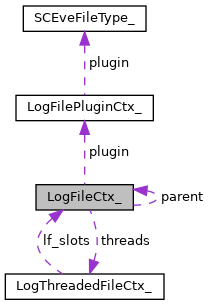 Referenced by AlertFastLogCondition(), LogFileNewCtx(), LogFileWrite(), and TLSGetIPInformations().